By Daniel Horowitz--For the past five years, Jewish Toronto, home to more than 200,000 Jews of all backgrounds, has been fortunate to have Israeli Consul General Amir Gissin in its midst, allowing its citizens to benefit from his wisdom, leadership and knowledge. Unfortunately, Consul General Gissin’s term comes to a close this summer, and he will be returning to his home in Israel. During his tenure as consul general in Toronto and Western Canada, Gissin worked tirelessly on behalf of the Jewish people, leaving an indelible impression in our community, and making his name synonymous with Jewish life in our city. Recently, UJA Federation of Greater Toronto paid tribute to the consul general at a farewell dinner hosted by community leaders Julia and Henry Koschitzky, where more than 200 people came together to show their appreciation for his efforts. "Every time you speak, you show us the heartfelt concern you have, not only for Israel, but for the Jewish people everywhere," said UJA Federation Board Chair Elizabeth Wolfe, who presented Consul General Gissin with an award on behalf of UJA in appreciation of his five years of service. "You have shared with us your commitment, your dedication, and your love for Israel and for our community, and we are forever grateful for that. Most diplomats spend the bulk of their time representing their government and a very small portion of time interacting with the local community. The reverse has been the case with Amir who has spent the bulk of his time getting to know our Jewish community, understanding our priorities, needs and concerns. It is Amir’s ability to unite those concerns – from both the Israeli perspective and the local perspective - that has made him so successful here. We thank you for your dedication to our community. You have set the bar high, and we will all truly miss you." 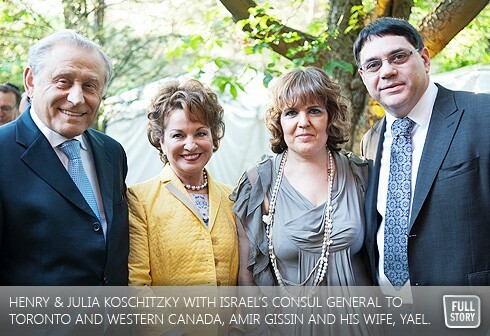 "Amir had a mission when he arrived in Toronto and I believe he has achieved that mission which was branding Israel in a positive light," explained the hostess of the evening, Julia Koschitzky. "One of the ways he intended to do that was by showcasing how Canada and Israel are so much alike and by highlighting the positive aspects of Israel including its passion, its creativity, its innovation, and the incredible accomplishments it has made. He was also here for some contentious issues, whether it was those who tried to boycott the Toronto International Film Festival, or Israeli products, he was in the forefront, leading the way in combating this negativity and turned it around. In the process, he also rallied the community and, as a result, we were there to make sure it wouldn’t happen again. We as a community have a responsibility to carry on his legacy." "When you deal with Amir, you’re getting the highest level of professional excellence that you’d ever want from a representative of Israel, and you’re getting a person who really cares about his Jewish identity," said UJA Federation President & CEO, Ted Sokolsky. "Amir has been an amazing partner for UJA Federation because one of the things we believe is that Jewish Toronto, as a community, has to show leadership in the Jewish world. Part of that leadership has to be at the forefront of the changing paradigm between Diaspora Jewry and Israeli Jewry. I can’t think of a consul general who better understood the potential power of the Diaspora in forwarding the strategic goals of Israel, and vice-versa." During the evening, Canadian Prime Minister Stephen Harper praised Amir’s efforts on behalf of both Canada and Israel, in a letter read by Shimon Fogel, CEO, The Centre for Israel and Jewish Affairs. In the letter, PM Harper spoke of "Amir’s efforts, and his role in the exceptional bilateral relationship, based on shared values, common interests, and strong political, economic, cultural and social ties," between the two countries. Then it was time for the man of the hour to speak. "This community has made me a better person," said Gissin. "Any achievements I have made are only because of the energy that was flowing from Jewish Toronto to me. Toronto will always be our second home. I feel that I was very privileged to be here during a time of great change. I think that what we achieved here, and how UJA Federation handled a number of challenges, showed the way to many other communities in North America and around the world. I’m sure that after I’m gone, you will continue to see that Jewish Toronto continues to lead the way." Then, in a lighter moment after someone asked him about his future plans, Gissin quipped, "We are returning to Jerusalem where we plan on opening a small restaurant called Bathurst, in which we will only welcome Canadian customers."